[127 Pages Report] The APAC Project Portfolio Management market size accounted for USD 522.0 Million in 2016, which is projected to reach USD 1,352.8 Million by 2022, at a Compound Annual Growth Rate (CAGR) of 18.2%. Factors such as huge infrastructure development in the APAC region, need for optimum resource utilization and cost management, proliferation of startups in APAC, and globalization of enterprises in the APAC region are fueling the growth of the APAC PPM Market. The base year considered for this study is 2016, and the forecast period considered is 2017–2022. The APAC Project Portfolio Management market ecosystem includes vendors such as Upland Software, Inc. (Texas, US), Planview, Inc. (Texas, US), Planisware S.A.S. (California, US), Oracle Corporation (California, US), Software AG (Darmstadt, Germany), SAP SE (Walldorf, Germany), Microsoft Corporation (Washington, US), Changepoint Corporation (Washington, US), CA Technologies (New York, US), Hewlett Packard Enterprise Company (California, US), Clarizen (California, US), and ServiceNow, Inc. (California, US). Other stakeholders of the APAC PPM market are cloud platform providers, consultancy and advisory firms, system integrators, training and education service providers, and application service providers. The APAC Project Portfolio Management market size is expected to grow from 586.9 Million in 2017 to USD 1,352.8 Million by 2022, at a Compound Annual Growth Rate (CAGR) of 18.2%. Some of the factors driving the growth of the APAC PPM market are huge infrastructure development in APAC, need for optimum resource utilization and cost management, proliferation of startups in APAC, and rapid generation of complex data volumes. The APAC Project Portfolio Management market report has been broadly classified on the basis of types, applications, deployments, organization size, countries, and verticals. The integration and deployment services segment is expected to grow at the highest CAGR and continue its dominance during the forecast period. Integration and deployment services are gaining traction in the market, as they help organizations in identifying the project scope; designing the plan layout; optimizing data quality and delivery through testing, building, and deploying customizable designs suiting the organizational business needs; and assisting trained professionals in ensuring the smooth installation of PPM software. The resource management application is expected to witness the highest CAGR during the forecast period. Proactive resource management delivers paramount levels of optimization and efficiency by enabling optimum allocation of resources, based on business requirements. The resource management application ensures that resources are provisioned as per organizational needs and are in alignment with overall business priorities and objectives. The need for resource management is expected to grow in the near future, due to benefits such as better resource utilization, improved profits, and minimized unavailability of resources. The Small and Medium-sized Enterprises (SMEs) segment is expected to grow at a higher rate during the forecast period. Cost-effectiveness is one of the important needs of small businesses. Vendors satisfy this need by providing simple tools that help manage people, projects, and assets. Small businesses usually adopt Software-as-a-Service (SaaS) based PPM solutions, due to cost constraints. Additionally, the SaaS model minimizes IT requirements. The SMEs segment has huge potential for flourishing during the forecast period, as PPM software provide flexibility, scalability, and reduced costs. The retail and consumer goods vertical is expected to grow at the highest CAGR in the APAC Project Portfolio Management market during the forecast period. The retail and consumer goods vertical leads the market in terms of cost cutting, revenue margin improvement, and latest technology adoption. Retailers are now adopting new technologies, such as location-based marketing and internal work localization, to attract customers and take full advantage of online business opportunities, which are vulnerable to various business complexities. Among the countries taken into consideration for the study, India is expected to witness the highest CAGR during the forecast period. India is a preferred country for outsourcing IT services. Several companies have outsourced their IT services, such as application development, maintenance, testing, consulting, and system integration to India. This offshoring of IT services has given rise to a large number of IT players, who need PPM software. The rise of an energetic startup product ecosystem in India has also enhanced opportunities for the PPM market in India. The ever-increasing internet penetration, due to improvement in wireless infrastructure, is expected to drive the demand for PPM software in India. With more and more businesses in India going online, the demand for effective PPM software is expected to increase. This increasing demand will be effectively catered to by APAC PPM vendors. A healthy economy, combined with government initiatives such as Digital India, is expected to drive increased investment in PPM software and services. 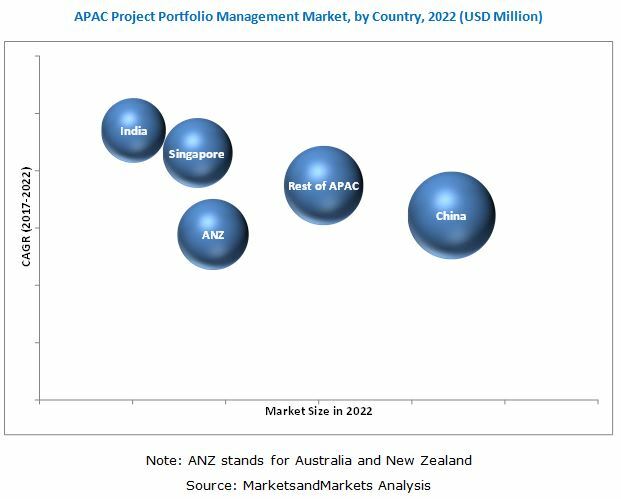 The APAC Project Portfolio Management market is restrained, due to increasing security concerns among APAC organizations. The major players in the APAC PPM market include Upland Software, Inc. (Texas, US), Planview, Inc. (Texas, US), Planisware S.A.S. (California, US), Oracle Corporation (California, US), Software AG (Darmstadt, Germany), SAP SE (Walldorf, Germany), Microsoft Corporation (Washington, US), Changepoint Corporation (Washington, US), CA Technologies (New York, US), Hewlett Packard Enterprise Company (California, US), Clarizen (California, US), and ServiceNow, Inc. (California, US). These players have adopted various strategies, such as new product developments, acquisitions, and partnerships, to increase their foothold in the APAC PPM market. Technology innovations is an area of focus for these players to maintain a competitive market position and promote customer satisfaction.